The world’s most unusual love seat and sofa are not merely on display these days at L.A.’s Craft and Folk Art Museum—you can sit right down on them. 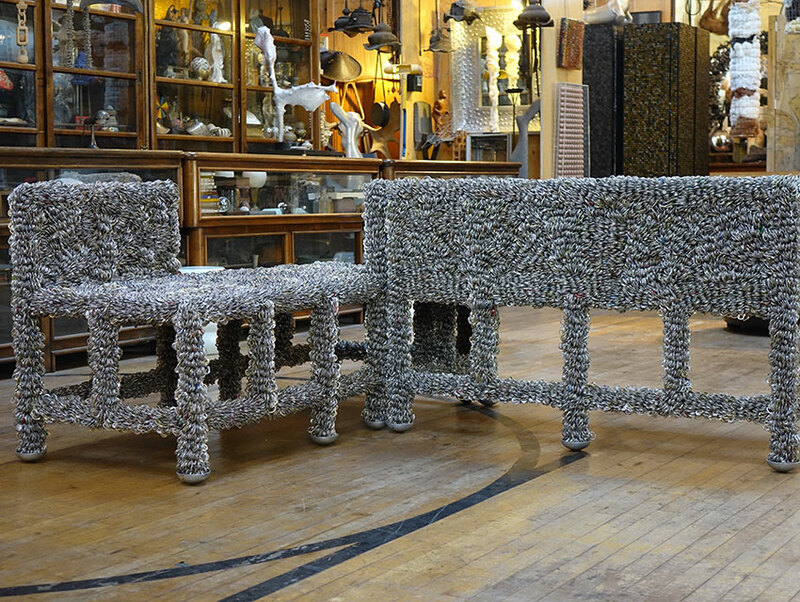 What you’ll probably notice first about these un-upholstered pieces of furniture is the unique material they are made out of: pop tops. That’s right, the kind you pull off or push in to open a can of soda. All in all, the seats and their matching table incorporate about 1.5 million of the aluminum tabs. Artist Clare Graham estimates he has gathered and used something like 13 or 14 million pop tops in various works. Though this exhibition space in CAFAM is only about half the size of MorYork, Graham and curator Brooks Hudson Thomas have exuberantly crammed in all kinds of pieces made of all kinds of materials scavenged from recycling centers and anywhere else Graham and his support network have gone to look for buttons and bottlecaps and dominos and toy googly eyes and paint-by-numbers sets and badminton shuttlecocks and stuffed animals and…well, lots of different stuff.